Child car-seat safety rules that came into force with the new year included new testing requirements and higher weight limits for car seats as well as a new definition of infants. 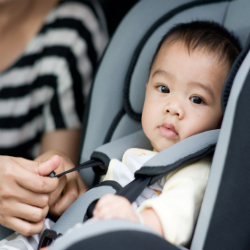 "As a mom, I want to have confidence that my child is secured in the safest car seat available," said Health Minister Leona Aglukkaq late last week. "When these new regulations come into force on Jan. 1, child car seats sold in Canada will meet Canada's highest testing standards and, therefore, will be as safe as possible." The updated rules are part of a regular review of safety standards using the most up-to-date technology available for testing. The updates align elements with those in the United States and incorporate specific Canadian testing requirements. Allowing harnesses to be used on school buses by special-needs children. Aglukkaq's release said there is no need to replace an existing child seat as a result of the new standards. But seats should be replaced if they were installed in a vehicle involved in a collision or if the shell or materials on the seats are ripped or damaged. Parents should also check the expiry date of the seat and be sure to replace it when it reaches that date. For more information on car seat safety, visit the Transport Canada website.